Marine Corps Times is one of several publications that covers the all-too-common phenomenon in which random wannabes pretend to be Marines. 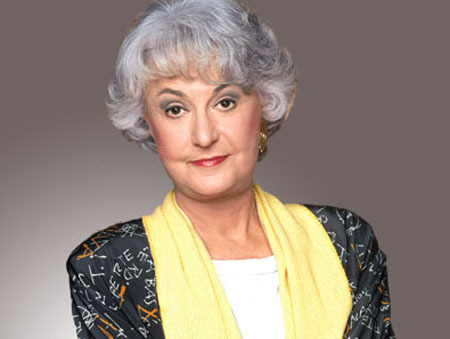 Here’s a twist, though: Military records show the late Golden Girl Bea Arthur was one of the first female Marines ever — even though she denied it. The Smoking Gun published the scoop yesterday, reporting that records show Arthur enlisted at 21 in 1943. The records also show she had a colorful background to say the least. She died last year at 86. The military records, released in response to a Freedom of Informaton Act request, include “misconduct report” filed against Arthur while she was stationed at the Marine Corps Air Station in Cherry Point, North Carolina. That misconduct determination stemmed from Arthur’s contracting of a venereal disease, which left her “incapacitated for duty” for five weeks in late-1944. As a result, her pay was reduced for that period. Well, I can’t say I saw that one coming, either. I am offended that you would publish her private medical records. I feel that is conduct unbecoming. It is not information that the public NEEDS to know. You should allow her the dignity of her privacy. So she had VD, big deal. She was a great actress who brought a lot of laughs. She served her country as a Marine. Show some respect. Liz, no medical records were published here. The Smoking Gun published disciplinary records showing she missed several weeks of duty. The woman has had a colorful life, she shoul be remebered for what she did! Even though they list why she was givin a “misconduct report” it could have been worded differently and I dont think that a mention of the report takes away from what she accomplished in her life. Barney, I agree. All they would have had to do was say ‘stemming from an illness’ rather than saying ‘venereal disease’. I think it is wrong to publish that and I feel it is private medical information that should be protected. The woman is dead and unable to defend herself or give an explanation. She may have been raped for all we know. I just think it is disrespectful and also irresponsible for that information to be published. It could be hurtful to her family. She should be honored for her service as a Marine. It is disrespectful to her and I wish she were still alive to raise holy heck on those who made this information public. I am very sad that someone thought it necessary to publish information about Bea Arthur’s personal health record. That she was a very private person is known. I’m just glad she will never have suffer additional embarassment over this. Did anyone consider how her family might feel? After looking at the dates of all this, her husband, Robert Aurthur, probably infected her. She never wanted to talk about him – maybe now we know why. Rest in peace, Bea, you have more than distinguished yourself in your lifetime.